Chef Emeril Lagasse just keeps going and going. He held " The Ultimate Tailgate Party" for a star studded invite only event at his latest project Lagassee's Stadium in the Palazzo Resort in Las Vegas . Lagasse’s Stadium combines Emeril Lagasse's signature dishes with over 100 HD TVs including a 9ft x 16ft main TV, luxury boxes, plush stadium-style seating, billiard tables, and outdoor patio over looking the Las Vegas Strip. In addition to watching your favorite team on the large screens , sports betting stations, black jack and craps tables, as well as video poker machines, billiard tables and video arcade games will keep you entertained even if your team is loosing. 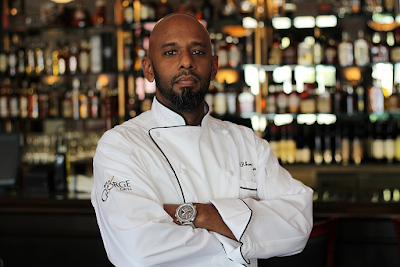 Lagasee's dishes are a combination of traditional stadium-style food and the Southern dishes he is known for. The menu is varied and features popular and upscale items offering guests the option to choose their meal according to taste and budget. “If you want to take a break from this and have a little white tablecloth experience, you can go in the dugout and have anything from a great barbequed salmon to a great steak and great wine,” he said. We walked past the bar and into the themed VIP viewing rooms with a feeling of awe. This is not your normal "sports book" This is a sports venue its its own right. Emeril is known to be very flamboyant and needs no introduction. Many consider him to be America's most recognized Chef. With his own cheerleaders and of course a New Orleans band. Emeril really knows how to make an entrance and he made a big one at the Grand Opening of Lagasse's Stadium. With help from Celebrity sports fans and athletes such as , Jeremy Piven, Kevin Dillon, Rex Lee, Melissa Rycroft and fiancé Tye Strickland, Bruce Jenner, Laker’s player Derek Fisher, female race car driver Danica Patrick, Olympic swimmer Dara Torres, Olympic gold medalist Bruce Jenner, Lakers coach Brian Shaw, football star Warren Sapp, retired basketball player Gary Payton, baseball player Greg Maddux, Howard Stern’s wife and model Beth Ostrosky, Queer Eye for the Straight Guy’s Carson Kressley, actor Dan Cortese, actor Chazz Palminteri , Chef Emeril let the stars shine at his newest creation. Lagasse's Stadium offers something for everyone from simple food to white table cloth service. It is truly a new way to dine at what used to be called " a sports book " . Emeril , as usual has changed the way we look at dining as we enjoy sports and gaming. Join Vino Las Vegas as we visit the "Ultimate Tailgate Party " and help launch a new sports venue with the stars . We always enjoy taking a look at unique, boutique wines. 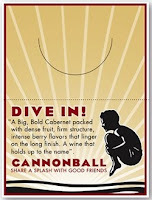 Recently we came across a lovely Cabernet Sauvignon from Cannonball Wines in California. Winemaker Dennis Hill is no new comer to the Industry. He made quite a "splash" as a Master winemaker and is responsible crafting Blackstone and Hayman and Hill wines . After tasting the Cannonball 2006 Cabernet Sauvignon , he is well on the way to having another hit. 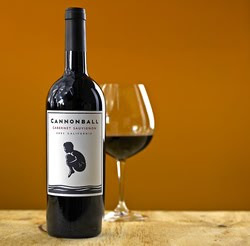 Cannonball Cabernet is comprised of 77 % Dry Creek Cabernet, 15 % Petit Syrah , 5 % Petit Verdot and 3 % Syrah. This blend produces a big bold Cabernet with alot of fruit. In the glass this medium to full bodied wine shows colors of deep crimson red and light garnet. On the nose hints of blackberry, strawberry, black cherry and coffee as well as spice treat our senses with an incredible burst of balanced fruit aromas . This is a big , bold Cabernet with flavors of black cherry, cranberry, black pepper and currant with cocoa on the mid pallet with a nice texture and smooth tannins combining for a long finish. In honor of its 10th anniversary inside the Venetian Resort, Hotel & Casino, Valentino Las Vegas has announced “Wine & Dine For The Cause.” Now through the end of September, a portion of the proceeds from Valentino’s daily specials, tasting menus and select wines will benefit “Keep Memory Alive” and the Cleveland Clinic Lou Ruvo Center for Brain Health for Alzheimer’s research. Guests have the option of ordering one of the daily specials, select wines or a signature Valentino tasting menu created by Chef Pellegrini. This is a great way to experience some of Las Vegas’ finest cuisine while raising money for a worthy cause. To learn more about the Cleveland Clinic Lou Ruvo Center for Brain Health and Keep Memory Alive visit www.keepmemoryalive.org. Valentino Las Vegas, sister restaurant to the world-renowned Valentino in Santa Monica. The menu, created by James Beard Award-winning Executive Chef Luciano Pellegrini, features an array of traditional and contemporary Italian cuisine that includes a variety of homemade pasta dishes, enticing entrees and decadent desserts. Valentino Las Vegas is located in the Venetian Hotel & Casino on the Las Vegas Strip. The Grill at Valentino opens daily at 11:30 a.m. for lunch and is available for business functions during the day. The fine dining room opens for dinner at 5:30 p.m. daily. 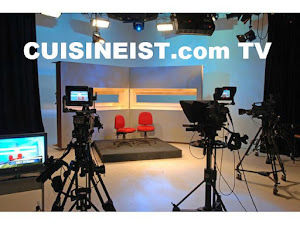 Call (702) 414-3000 or visit www.valentinorestaurantgroup.com. Keep Memory Alive supports the mission of the Cleveland Clinic Lou Ruvo Center for Brain Health. We are dedicated to the conquest of neurodegenerative diseases such as Alzheimer’s, Parkinson’s, Huntington’s, ALS and all forms of memory disorders. Our focus is to provide enhanced treatments and services for those afflicted with neurodegenerative diseases and to ultimately find cures with innovative medicine that is complimented by a focus on an improved patient experience. Both are 501(c)(3) organizations. To learn more about Keep Memory Alive and the Cleveland Clinic Lou Ruvo Center for Brain Health, call (702) 263-9797 or visit www.keepmemoryalive.org.